This is the 68th post in a weekly feature here at Spare Candy, called "In History." Some posts might be little more than a photo, others full on features. If you have any suggestions for a person or event that should be featured, or would like to submit a guest post or cross post, e-mail me at rosiered23 (at) sparecandy (dot) com. 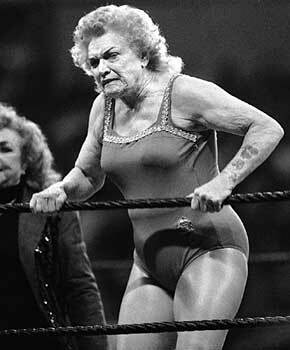 Johnnie Mae Young, often known as Mae Young, was born March 12, 1923. (Happy 88th birthday to her!) She is a professional wrestler and currently a WWE Ambassador. Young was an influential pioneer in women's wrestling, helping to increase its popularity during World War II and training many generations of wrestlers. She wrestled throughout the United States and Canada, and won multiple titles in the National Wrestling Alliance. She is a member of the Professional Wrestling Hall of Fame and the WWE Hall of Fame. 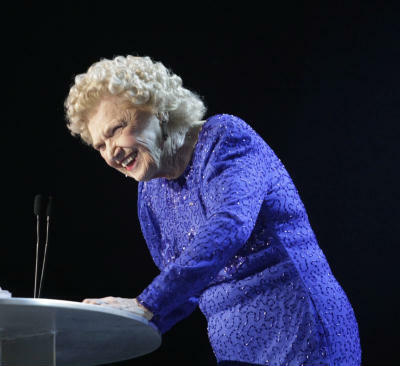 Here's something wild: Young holds the distinction of being the only professional wrestler to wrestle documented matches in nine different decades, having her first in 1939 and her latest match in 2011. Young was an amateur wrestler on her high school's boys wrestling team at the age of fifteen. You have to wonder how common that was back in, what, 1937? Her brothers taught her to wrestle and helped her join the team. Young also played softball with Tulsa's national championship team. While still in high school, Young went to a professional wrestling show and challenged then-champion Mildred Burke when she visited Tulsa to wrestle Gladys Gillem. Because the promoters told her she could not wrestle the champion, she wrestled Gillem in a shoot fight, beating her within seconds. After the fight, promoter Billy Wolfe wanted Young to become a professional wrestler. She left home two years later to wrestle professionally. In 1941, Young, along with Mildred Burke, opened up Canada for female wrestling. In Canada, they worked for Stu Hart, a wildly popular wrestling figure and the patriarch of perhaps the most famous wrestling family. During World War II, Young helped women take advantage of the fact that the men were fighting overseas by expanding their role in the sport. Young still shows up on WWE from time to time, still going strong after all these years. You can read more about Young at WWE's website. Pretty amazing. I had no idea that women were wrestlers so far back in history. Thanks for this piece.